This is a comprehensive review of the Celestron NexStar 8SE telescope, showing you the good and the bad. If you’re serious about parting with a significant chunk of cash, for what is a great telescope, then read on. We also believe you shouldn’t be surprised by what you've bought after reading one of our reviews. Like all the great things in life, the 8SE is not perfect (sadly). Read on to discover its small imperfections (and how to beat them), find out how to get the most value out of it and discover what current owners have to say about the 8SE and why they think it was well worth the money spent! Ideal for beginners and upgraders who want a huge aperture, easy goto set-up, a 40,000 object database and motorised tracking all for a relatively low price. In the range, there are 4”, 5”, 6” and 8” models. Each model comes with an altazimuth mount. Also included are motorized go-to tracking with easy 3-star alignment (we'll look at that in more detail later) and a database of 40,000 objects. The 8" NexStar is more popular than both the 4” and 5” models, and collects 77% more light that the 6" model. In this review, we’ll break down why it such a desirable scope and, more importantly, whether it’s the right one for you. Ideal For: Beginners and upgraders who want a huge aperture, easy goto set-up, a 40,000 object database and motorised tracking all for a relatively low price. An 8” primary mirror is a thing of beauty. With that aperture, you’ll be able to see objects down to magnitude 14, which just brings Pluto within reach if you have dark enough skies. The optics in the NexStar 8SE are incredibly well made and provide brilliant image clarity and detail. It’s aperture and focal length, mean the 8SE gives great viewing at the 150x to 200x magnification levels. This is ideal for the moon and planets, and you can push it beyond 200x for bright objects in good seeing. Of course, it's big aperture will show dimmer objects like galaxies and nebulae in detail. Even if you've had a 6" scope before, this one, with its extra 2" of aperture, gathers 77% more light- which makes a big difference to what you can see. This article gives you much more detail about what you should expect to see with 8" of aperture, compared to just 6 inches. For example, looking at the second-last row, you'll see that a telescope of NexStar 8SE’s size will do a much better job of resolving double stars separated by less than an arcsecond. A similar discussion about what the 8SE can see was had in the Stargazers Lounge forum, and you can read the conversation here. Build quality is robust on the NexStar 8SE. That doesn’t mean it can be abused without consequence. But, it should suffer the odd knock in the field without you paying a heavy price for it. Whether you knock it or not, all telescopes which use mirrors come out of alignment eventually. When that happens on your 8SE, you'll have to collimate it (here's our collimation guide, it opens in a new tab). Collimation requires a screwdriver to adjust the three screws which hold the mirror in place (find them at the rear of the telescope). To make the process easier and less risky, replace the screws with a set of ‘Bob’s Knob﻿﻿s’. With these in place, collimation becomes a less risky job you can do with just your fingers. When you see a picture of Celestron’s 8-incher, you might not appreciate just how easy it is to set up and transport. As with any telescope, if you read the instruction manual thoroughly first, setting it up will be easier and faster. Even so, if you've never used a scope before, allow yourself at least an hour to get going. With repeated use, you will get quicker at setting up and taking down the 8SE. Many owners report that once you’ve gone through the process a few times to get used to it, setup takes as little as fifteen minutes. Takedown is just as quick and the whole scope packs away into rather small dimensions - certainly small enough for the average trunk. Which brings us to the question of storage. Your 8SE will arrive in boxes that are robust and adequate for storage and transporting, to begin with. Over time and use, they will get tired. When they stop being useful, consider the storage/carrying case designed for the NexStar range. This will make it easier to carry and provides your precious telescope with great protection during storage and transportation. Like all catadioptric scopes, the tube is a sealed unit, so takes a long time for the air trapped inside to equalize its temperature with the outside world. When there's a difference in temperature between the scope and the air outside, you don't get great performance. For best viewing, get the scope set up outside 2-3 hours before using it. If the night is cold, use a dew shield to prevent the scope misting up with condensation. An altazimuth mount is one which can be simply moved up/down and left/right. This means you can point your scope at any part of the sky. Unlike an equatorial mount, altazimuth mounts are not aligned to Earth's angle of rotation. Why is that important, you might ask, well… unless you’re thinking about astrophotography, it’s not important at all. The 8SE comes with a computerised tracking motor and it will keep objects in your eyepiece as they slowly move across the night sky. For naked eye viewing, that's great. However, if you do want to get into astrophotography, then the tracking motor coupled to an alt-az mount has limitations. In particular, there is some ‘drift’ of the scope over time. This means images with long exposure times will have trails on them. Bright objects, such as the moon and planets, only need short exposures, so you can still produce great astropics of them with the 8SE. If deep space galaxies and faint nebulae are your things, then that's more of a challenge, although this guy seems to be doing just fine, judging from his pictures. You can mount the 8SE on an equatorial mount and the Celestron C90 T-adapter and T-mount let you attach your DSLR camera to the 8SE. The major benefit of an altazimuth mount is you don't need to worry about polar alignment. Your scope is ready to go as soon as it's mounted. When setting up the Celestron NexStar 8SE though, actually attaching the telescope to the mount is the most difficult part of setup. Advice from owners is to attach the scope to the single-armed fork first (and on a soft surface like carpet to prevent scratches). Then, make sure it’s securely locked in place before finally attaching the fork to the stand. You’re much less likely to damage the scope accidentally doing it this way. Because you won't be using the locking screws whilst holding a heavy telescope above waist height, there's less chance you'll slip and damage the scope. One other piece of advice is to mount the telescope as far forward in its mounting housing as you can safely get it. This prevents the eyepiece hitting the mount when you point the scope towards the zenith. For the NexStar models, Celestron has chosen to mount them on a single-armed fork. That single arm has to support a lot of weight in the 8SE. Without a steadying second arm, you will see some minor vibration at the eyepiece when you touch the scope, such as when adjusting focus. So, you’ve got your wonderful NexStar 8SE mounted and ready to go. It’s time to complete setup by telling it where in the world you are so you can find objects to look at with ease. The database and goto motor take away all the heartache of trying to locate an object by map reading and star-hopping. Instead, with these clever electronics, you'll go straight to the object you want to see and use your precious viewing time studying it rather than trying to find it! A galaxy and nebula takes up such a small piece of sky that your telescope needs incredibly accurate aiming to get it centred in your eyepiece and then track it as Earth rotates. To be as accurate as possible, Celestron’s goto system needs to know exactly where on the planet your telescope is and the precise local time. Before doing any of that, you must make sure the telescope is level (it comes with a spirit level) and the viewfinder is aligned with the scope (otherwise you won't be able to point it at the three bright objects when the time comes). The easiest time to align the red dot viewfinder is during the day. Point the telescope at a distant, stationary object like a telegraph pole, chimney or radio mast. Centre the top of the object in your eyepiece. Now, without moving the main scope, adjust the viewfinder so that the same object’s top is in the very centre of the viewfinder. When it is, your scope and viewfinder are aligned! At night, when you’re ready to use the scope, enter your location. You can use the nearest town, but you’ll have a better experience if you put in the coordinates of where you’re actually observing from. Put the local time in the go-to controller. You also need to give your timezone and say whether daylight savings is in force or not. With that done, it’s time to do the three star align. Find three bright stars in your sky. It's best if they're in different parts of the sky and there are no points of light nearby which could confuse the sensor, such as street lights. Celestron’s video shows you exactly what to do. That's it, you can now start observing! Pick a star, planet or deep space object from the database and get looking. Our advice is to do some daytime preparation for an evening's viewing. Make sure you know what's visible at the time and location you’ll be using the scope. That way, you won’t waste time trying to see stuff that’s not out. The goto controller is ‘powered’ by AA batteries. However, you cannot use rechargeables as they don't have enough ‘juice’, and even a decent branded set of AAs will get quickly eaten by your setup. If you buy the adapter, make sure you get at least six foot of cord so you won’t pull it out moving the telescope around. Your first night as an 8SE owner will be so much more rewarding if you've got your power source sorted! The NexStar database has 40,000 objects stored within it. You select from planets, stars and deep space objects using the controller. Make your choice and the telescope will quickly slew to point at it. As you get more into astronomy, you may want to use other software for controlling your 8SE. So, you’ll be pleased to learn that you can do exactly that. The free (and brilliant) software Stellarium can be used control your goto motor, just see the video for how. You can also use your iPhone or iPad to control where your telescope is pointing by using the SkyQ Link (affiliate link). Essentially a WiFi adapter, the SkyQ Link picks up control signals from your iDevice using the relevant app. Verdict: The NexStar 8SE's goto and tracking motor is a very intelligent piece of programming. By simply telling it where you are, your telescope will find up to 40,000 different objects for you to look at... and you can just enjoy seeing them, rather than wasting time trying to find them. We think it’s really important to hear what existing 8SE owners have to say about the scope before you make a decision to buy it for yourself. There are plenty of reviews around the Internet, so we’ve gathered a sample of views from owners of the NexStar 8SE. You can read the full detail by clicking on the links below. Here's another newbie owners guide. It's comprehensive, but the flashing adverts might put you off reading it. Amazon.com reviews. At the time of writing, the vast majority of reviews for the 8SE are four- or five-star. This is an incredibly comprehensive review and well worth a read. If you take the time to read and watch these owner accounts, you will probably come away with the impression that we did. Verdict: Owners really rate the quality of the telescope for the price they paid. Niggles about vibration and batteries are always followed by how they don't distract from the excellent optics and the simplicity of the goto tracking motor. We hope this comprehensive review of the Celestron NexStar 8SE has helped you make a decision. If you go ahead and buy the 8SE the following links will help get the most enjoyment from your brilliant new telescope. This 8”, go-to telescope is a brilliant telescope for both beginners and upgrading novices. You will love how easy it is to set up and use. 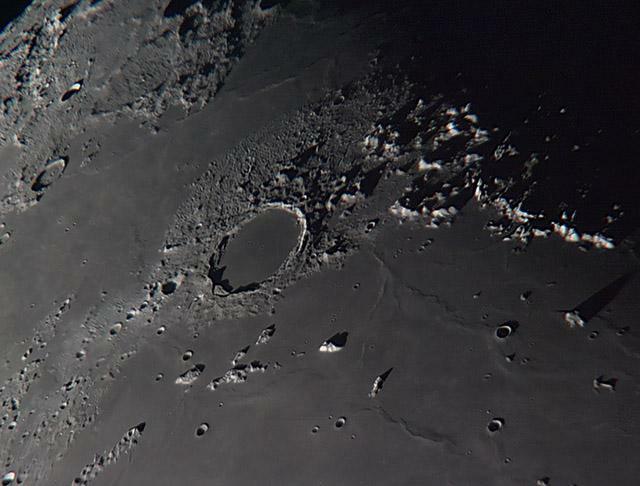 The images you see at the eyepiece will take your breath away if you’ve never used a scope before. Heck, even if you’ve had a 6-inch refractor already, this one will blow your socks off as it gathers 77% more light. It will show you much fainter objects than you've ever seen for the first time. 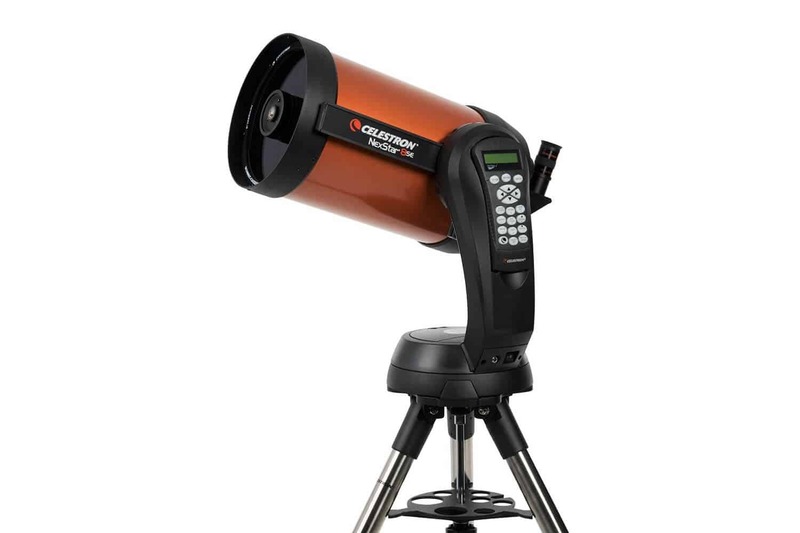 From all you’ve read in this review, you buy the Celestron 8SE with your eyes open. You will have to buy another power source and vibration dampeners will be a wise investment. Other than that, you are great to go right out of the box!